The Technical Confluences Indicator shows that the recent slide of the USD/CAD breaches a dense cluster of technical support lines at C$1.2615. Below, there are only weaker lines, so the door is open to testing the lows at 1.2550. The dense cluster that has been breached is around 1.2615 which is the convergence of the SMA50-4h, the one-hour low, the SMA200-1h, the SMA5-15m, the Fibonacci 38.2% one-day, the SMA10-15m, the SMA100-15m, the Bolinger Band 15m-Middle (Stdv. 2.2), the SMA200-1d, and the SMA-5–1hv. 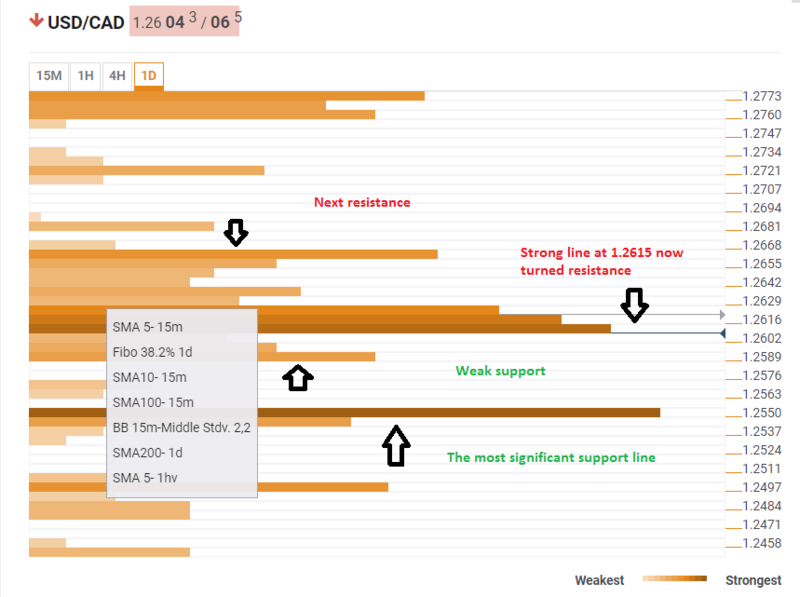 Some support awaits at 1.2583, which sees the BB 1h-Middle, SMA100-1h, SMA-5-1d, and the Fibonacci 61.8% one-day. But the most critical support level is only at 1.2550 which sees the confluence of the most potent technical levels: the one-month low, the one-week low, the one-day high, and the Bolinger-Band 1h-Lower to top it off. In case that the pair recovers, it will first have to recapture 1.2615 before trying to overcome a long list of technical resistance lines that are spread out. 1.2655 stands out as the Fibonacci 38.2% one-week and the one day high. The Confluence Detector finds exciting opportunities using Technical Confluences. The TC is a tool to locate and point out those price levels where there is a congestion of indicators, moving averages, Fibonacci levels, Pivot Points, etc. Knowing where these congestion points are located is very useful for the trader, and can be used as a basis for different strategies. This tool assigns a certain amount of “weight” to each indicator, and this “weight” can influence adjacents price levels. This means that one price level without any indicator or moving average but under the influence of two “strongly weighted” levels accumulate more resistance than their neighbors. In these cases, the tool signals resistance in apparently empty areas.